Newquay, a once small coastal hamlet of the Georgian era, is now a substantial holiday resort. In terms of local industries and employment there have been radical changes during the past 150 years. In centuries gone past the primary occupations were from the sea especially in terms of pilchard and herring fishing, from the land, including farming, and from various mining activities, significantly china clay. 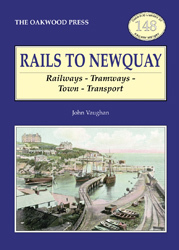 From 1849, when a tramway to Newquay was built, the commercial activity at the harbour hugely increased. A number of cottage industries grew rapidly from the turn of the 20th century, particularly clothing and knitwear, but by far and away the greatest influence was the development of tourism. This development was greatly facilitated by the availability of public transport, especially the coming of the railway to Newquay in 1876. In the Edwardian era direct trains from London operated and thousands of holidaymakers would arrive in Newquay by train. The service between Newquay and Par gradually increased in frequency and in 1905 another railway line from Truro via Chacewater, St Agnes and Parranporth to Newquay opened. Between the World Wars growth was significant and the holiday trade boomed. By this time buses and coaches were providing an alternative means of transport but it was the family car in the post-depression years of the 1930s which was to have the greatest impact. In the post-Second World War era the holiday trade quickly became re-established and Newquay was proving to be as popular as ever. The 1960s and 1970s were decades of transition. Gradually travel patterns have changed and now the car is king. The use of aircraft has hugely increased and some 400,000 passengers used Newquay Airport in 2007. The numbers arriving by train has significantly decreased but the Newquay branch line retains the distinction of being the only Cornish branch to enjoy through trains from distant locations on time-dated summer weekend. A5 format, 288 pages, 300 illustrations.